Already over 10 years old, this is technically a fully-fledged ‘XO’ cognac both under current French appellation laws, which require 6 years minimum ageing, and under the more stringent 10 year minimum due to be introduced in 2018. Blended from the Grande Champagne and Fins Bois growing areas – the latter, faster maturing cognac being added for extra roundness and depth - it has been slowly reduced to standard drinking strength of 40%. Brilliant gold, tinged with brown. Extremely distinctive, well-structured and full of character. Notes of tea, linden tree flowers, dried orange peel and creamy English toffee. An abundantly round, creamy structure with strong, fresh flavours. Somewhat fleshy, yet still subtle. A fine example of a distinctly ‘masculine’ cognac, aged in old oak casks. On its own after a meal, of course, but at any time of day a refreshing splash of spring water will open up the nose and flavours. 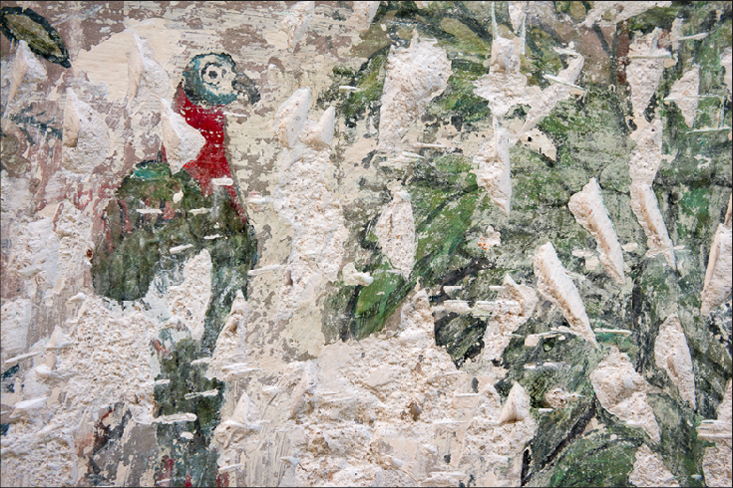 Although once covered in plaster, vestiges of these murals remain, revealing scenes of the countryside, such as the brightly coloured bird featured in Julia Hasse’s photograph. When I spotted this charming little bird, almost intact, it was a real delight. I love the look in his watchful eye, like a witness to days gone by.